At the beginning of a term, teachers may want to move sections from one course to another to consolidate their students. The Merge tool allows them to do this as well as view the students in each section, and change course names. However, once a teacher has entered assignments and grades, they are no longer able to move sections on their own. As a System Admin, you are always able to move the sections for teachers. Keep in mind that assignment and scores in School Loop are stored in the course. So when you move a section out of a course, you are moving it away from any existing assignments or grades that have already been entered. Consequently, you should move sections for teachers only if they are willing to re-enter those assignments and scores. Login to your System Admin School Loop account. Go to User Management -> Teachers. 3. 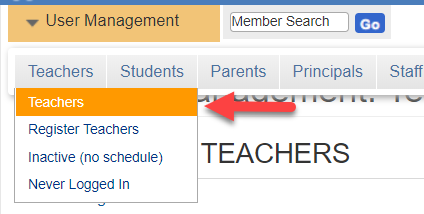 Click a teacher's name in the Teachers list to get to their Account Management page. 4. From the account management page click Schedule. 1. Click the Move & Merge button next to the section to be moved. 2. Check the button next to the course you want to move the section into. 3. Click the orange Submit button. The students in that section will now be part of that course and, therefore, part of the gradebook for that course.